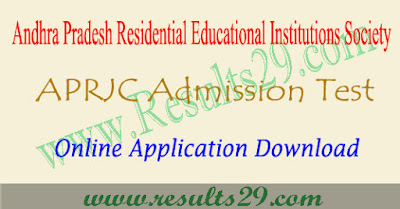 APRJC CET 2019 application form, apply online last date : APRJC 2019 Online Applications are invited from the candidates who have passed or appearing for the 10th class annual examination for entrance tests and admission into various intermediate Courses of Andhra Pradesh Residential Junior colleges, Inter courses are MPC, Bi.PC, MEC offered by Andhra Pradesh Residential Educational Institutions Society @APREIS for the academic year 2019-2020. Fee payment : Firstly Candidates have to visit the official website websites aprs.cgg.gov.in Click on fee payment link on home page there fore new web page will be opened. Fill the all details make a fee payment options. On payment of fee at ONLINE, the candidate shall be issued a Journal Number’ It is only a confirmation of the fee received. 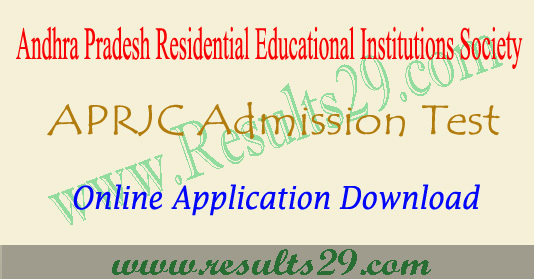 Next Submission of APRJC CET 2019 application form : Before submission of the aprjc Online application form 2019, the candidate has to fill up the Model Application form it is available under. On aprs web home page click on submission of online application form new window will be opened use the Journal Number fill the all details with duly filled model application. While filling the on line application, the candidate has to opt the course. Once a course is opted, that cannot be changed. Check the all details once again before the submission of aprjc online application form. On submission of APRJC 2019 Application ONLINE, the candidate has to take a hard copy of aprjc application form 2019 in which a reference number also be given it is the further use so preserve it. This Reference number is required to download the aprjc Hall Ticket 2019. The copy of aprjc cet 2019 application form is to be preserved for further reference. All the best for your aprjc 2019 entrance exam preparation. we update a detailed information of aprjc 2019. so stay tuned with us. keep visiting again for latest information.